The Bridge is the American remake of a Scandinavian television series. Not being Danish or Swedish, I cannot vouch for how this version compares to the original. However, being a native El Pasoan, I do feel I do have a unique vantage point on The Bridge. That is for another time. Today, we will be going over the pilot, which is an excellent piece of work. 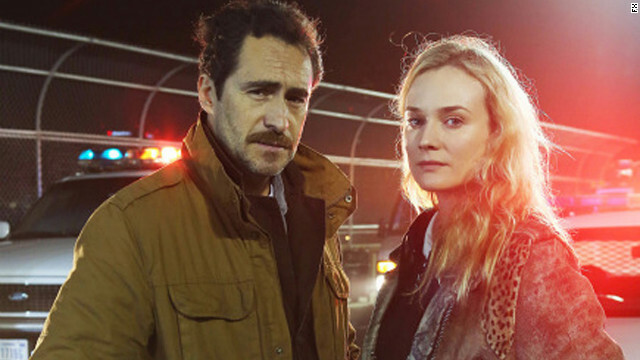 The Bridge sets off its tale of crime between borders brilliantly, showing how much is going on within both the crime being investigated and the investigators themselves. On the Bridge of the Americas joining El Paso, Texas (my hometown) and Ciudad Juarez, Chihuahua, Mexico, a body is dumped. As the victim appears to be an American judge, it would fall under the jurisdiction of the El Paso Police Department. The investigator is Sonya Cross (Diane Kruger), one who is a brilliant detective but has no tact whatsoever (the pilot strongly suggests she has Asperger's Syndrome but doesn't flat-out state it). On the other side of the border, Detective Marco Ruiz (Demian Bichir) is perfectly content to let the 'gabacha' take over. As he points out to Cross, he has his own crimes to solve (a group of heads found at the City Hall parking lot being among them). However, we get a twist in the tale. As the body is about to be lifted, we find that there are TWO bodies cut together to make it one. The American side has the Texas judge, the Mexican side has the body of a young girl, one of the thousands of girls who have disappeared in Juarez. With the discovery that we now have two crimes, a cross Cross has to contact Ruiz to find who the other half belongs to. In a subplot, Charlotte Millwright (Annabeth Gish) has recently been made a widow. Her husband suffered a major heart attack while in Mexico when both were looking at horses and, over Cross' loud objections, were allowed to cross the bridge to get to the American side by Ruiz. The Widow Charlotte was highly fortunate, as her husband Karl (Bobby Ray Shaffer) told her he wanted a divorce right before he croaked. However, as the episode continues and she goes to their ranch, she finds that a mysterious woman knows his private phone number and that a key holds a secret that she has not fully discovered. Meanwhile, Steve Linder (Thomas M. Wright) smuggles Eva Guerra (Sandra Echevarria) across the border, promptly locking her up in a remote trailer. How will she tie in to this strange murder? Will Cross and Ruiz be able to work well together? Will Cross' mentor Hank Wade (Ted Levine) be able to guide her as he announces to her that he will retire soon? The Bridge ends with smarmy and arrogant El Paso Times reporter Daniel Frye (Matthew Lillard) becoming the chief suspect after the video cameras find his license plates are on the car that dumped the bodies during a pre-programmed blackout. However, Frye himself is in danger: a bomb apparently has been placed in his car, but it was a fake. Instead, the cell phone timer has a message for Cross (and Ruiz): this crime is 'only the beginning'. Why should the death of one white female judge in Texas be more important than the thousands of anonymous girls murdered a few miles away. "How long will El Paso look away?" this voice asks. As I stated, in another post I will offer my own views as to how The Bridge captures or not my hometown. For the moment, let us look upon how well the pilot worked or not. The Bridge worked brilliantly: tense, taut, and terrifying. The pilot starts building its mystery, then throws in one twist after another that keep the audience both guessing and riveted. A great deal of credit goes to the performances all around. Chief among them is that of Bichir as one of the few honest lawmen on the Mexican side of the U.S./Mexican border. We know much about him through not just his way with words (his somewhat sarcastic, somewhat humorous reply of "Howdy, partner", complete with faux-Texan accent, when an EPPD officer greets him with an "Buenos diaz" tells you as much about Ruiz as anything), but we also see the kind of person he is in his interactions with his wife and son (another in the handful of Hispanic Oscar nominees, Maria Full of Grace's Catalina Sandino Moreno, and Carlos Pratts respectively). Bichir has an excellent scene when he follows procedure and goes to his captain for permission to work this case. It is evident that the Captain is corrupt, gambling in the mansion of a major drug lord, but Ruiz here shows he is fully aware of what kind of world he lives in, but still holds to the principles of law enforcement. If anything, in this episode Bichir steals the show as the lighter of the mismatched pair. I have never been convinced that Diane Kruger is a particularly good actress, but I think she gives the best performance of her career as Detective Cross. In her inability to empathize with people, her directness, her cluelessness as to how to provide a 'personal touch' when questioning people or dealing with others, it is clear that she has a form of Asperger's. Whether it is diagnosed or not, or even if she is aware of it, is something that I suspect will be another mystery The Bridge will address. In what is being billed as a 'guest appearance', Lillard shows he's capable of being more than Shaggy (or a variation thereof) as the arrogant but also frightened reporter who is caught up in this web of murder and mayhem. Levine, best remembered for his role in The Silence of the Lambs, shows he can be on the good side of the law. His scenes with Kruger where he offers his wisdom and counsel show an almost father/daughter type relationship between the two. One of the best things about Meredith Stiehm and Elwood Reid's screenplay is that the mystery is allowed to build and even throw in a few other stories that (one hopes) will tie in to the overall story of who killed these two women and why. As a pilot, The Bridge creates a great atmosphere of a mystery, bringing in great characters, strong performances, and a fascinating series of stories that starts the show off brilliantly.